The view from my village's front gate. 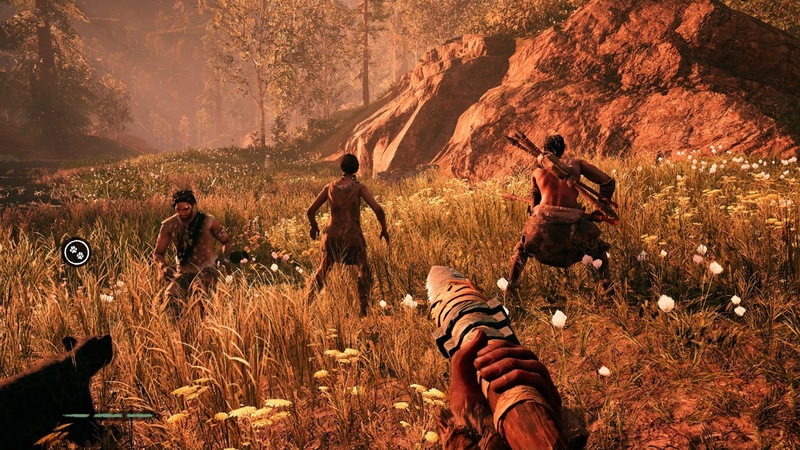 Seven days ago I began my journey with Far Cry Primal. I modified my settings to provide a greater challenge and remove some of the things that got in the way of my immersion (namely the minimap and aiming reticle) and since then I have hunted mammoths, tamed a sabertooth tiger, crafted various weapons and built a village. Because I've spent most of my time wandering around rather than pursuing the story, I haven't completed the campaign. I do feel that I've spent enough time with the game to give a more complete assessment of its highs and lows. I'm unashamed of my love for the Far Cry series. I charitably ignore the first game, with its Tri-Gen mutants and instead focus on the later entries. The open world settings, the variety of tactics, weapons and satirical humor are real sweet spots for me. The villains have been among some of the best in recent years, with Far Cry 3's Vas the most notable among them. Going into Primal, I was concerned about how many of those elements would still be present. Because of the setting, Primal has no English speaking characters. All of the dialogue is spoken in a "proto-European" language that was approximated by a group of linguistic anthropologists. As fascinating as that is, it means that there is little space for the same humor I'd grown accustomed to. Most of the characters speak matter-of-factly about their situation and your objectives when giving you quests. There is no word play, no smartly sardonic quips. As much as I miss it, I understand its absence. A few of my tribe members panic at the sight of a crow. I'm less impressed with the villains of Far Cry Primal. Ull, the leader of the Udam tribe is interesting in that he and his ilk appear to be a tribe of Neanderthals, but he seems to be little more than a brute. Batari feels like a less helpful, more antagonistic version of Far Cry 3's Citra. She is not terribly threatening, and is honestly one of the plainest villains the Far Cry series has ever had. I miss the deep, layered characters live Vas and Pagan. Their motivations even made sense in a twisted sort of way. If there is more depth to Batari and Ull, I've yet to see any of it. Thankfully, the gameplay in the land of Oros is quite compelling. It's a huge place to explore (even if it does use the Far Cry 4 map) and there is always something happening. Without a minimap lighting up all the quests and resources around me, travel can be a bit disorienting. Not to mention that I have to keep a sharp eye out for anything trying to creep up on me. Having relied on it through the last 2 games in the series, it's a wonder I ever finished Far Cry 2, but I'm happy for the challenge it affords. There is plenty to do in Oros, no matter where you are. You have to craft all of your weapons, so you'll constantly be seeking out resources to keep up your supply. Later in the game you'll get larger packs to carry more basic materials, but it's best to grab whatever you see whenever you can. Hunting, which was largely a side quest that improved your equipment in previous games is now a vital part of the experience and is a great deal of fun, regardless of your quarry. You'll use the resources you take from them to craft winter clothes, upgrade weapons and improve some of the huts in your village. Teensay is one of the first of the special Wenja tribe members you encounter. That village plays a more dynamic part in the game than I had expected. As you complete missions, raid outposts, etc, more people join your tribe. More tribe members earns you greater amounts of resources left in your cave as "reward resources." Some special tribe members open up new skills for you to learn or offer new craftable items or weapons like slings or huge two-handed clubs. Hands down though, the most enjoyable part of Primal is taming beasts. You're only able to tame a few of the predatory animals in Oros, but there is a surprising tactical variety to them. The small Dholes may not be the toughest companions, but they will skin whatever they kill for you and fetch nearby resources when you are idle. The wolf reveals more space on the minimap (useless to me), the jaguar can silently kill enemies and the sabertooth tiger not only the fastest animal in the game, but is also ridable. Taming the animals isn't as simple as unlocking the skill in a menu. First you have to locate the animal in the wild, then you have to bait and tame it. It's little more than holding down a button, but even the slightest distraction can have disastrous results. The first time I attempted to tame a jaguar, another member of my tribe (presumably out hunting) shot it in the side with an arrow just as I was about to finish the taming animation. What was supposed to be my new best friend shrieked and hissed killed me on the spot. 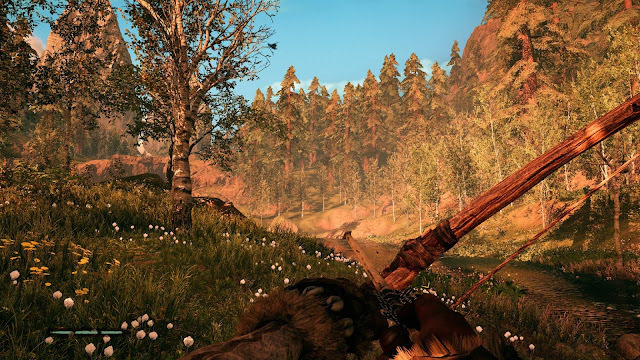 I've really enjoyed my time with Far Cry Primal so far. Despite the less interesting story, I'm still captivated by the game world and its many residents. Primal is a brave change for the Far Cry team and it succeeds in most places.The chaotic hilarity of the open world is a blast to watch (as long as you keep one eye open). The weapons, despite having been drastically reduced in variety, still feel fun to use. 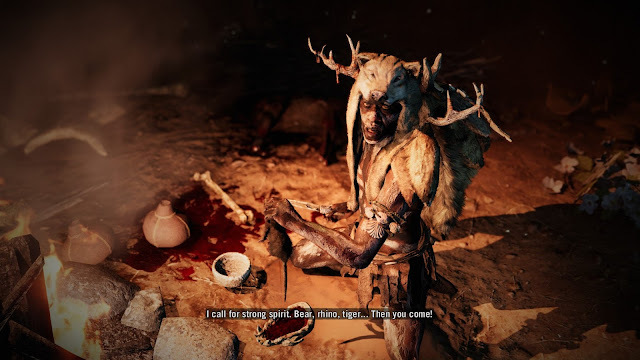 though I lament the loss of truly deep and interesting villains, I can still feel good about recommending Far Cry Primal to anyone looking for something different in an FPS.